Please complete inquiry form below for availability, estimated pricing, or a site visit for your upcoming special event. Each event requires signed contract, deposit and food and beverage minimum. Off-site food and beverage prohibited. Tanta’s private dining room is located on the restaurant’s second floor next to its year-around rooftop terrace – perfect for a summer product launch or an intimate company holiday party. We offer family-style brunch, lunch and dinner menus, food stations, as well as, passed appetizer selections for cocktail receptions. A Tanta event is not complete without sipping our classic Pisco Sour! Our bar packages are designed to include all of our Signature House Cocktails. Food and beverage options can be customized to fit your needs. Tanta’s event professional will be with you each step of the way to customize and create a memorable experience for you and your guests including audio-visual needs, floral arrangements, chef demonstrations or live music to enhance the evening. To plan your next Peruvian-style celebration, please contact our Event Manager at 312-222-9604 or events@tantachicago.com. The Private Dining Room, located on Rooftop Terrace level, spans 950 sq ft features a stylish design, full-service private bar, equipped for A/V needs, view of the rooftop terrace, and handicap accessible with restrooms conveniently located on the same floor. From May to October, the Private Dining can extend and connect with the enclosed rooftop terrace to accommodate up to 90 guests for standing reception. 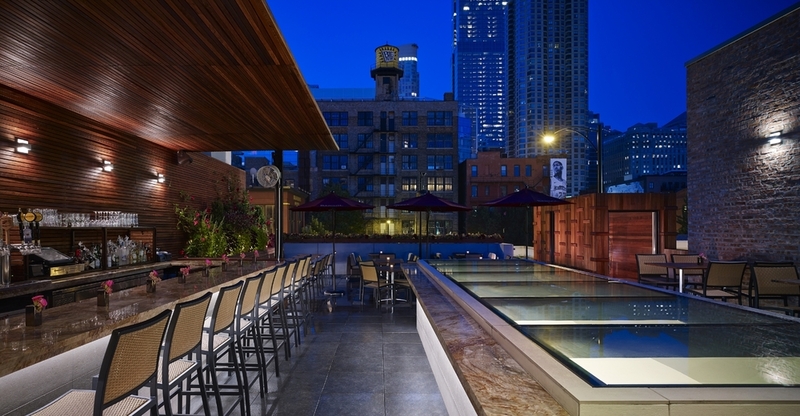 The Rooftop Terrace is 1,550 sq ft of tranquility in a modern urban setting. It features a stylish full-service bar, back-lit skylight island looking down to the main dining room and a retractable awning with additional space inside the Private Dining Room for inclement weather.